The mister and I ventured out yesterday to an international farmers market near us. The girls and I have a standing rule that we will try one new food item every time we go. Ours is usually a fruit of some sort or the occasional vegetable. Most of the time it’s turned out very good, but we have had the occasional “I’ll never eat this again” moment. The mister, being the meat and potatoes kind of guy that he is, thought we needed to try goat meat.  Really?? In my mind, goat meat is going to be tough, so let’s break out the Instant Pot again! Besides, I really LOVE it! Have I mentioned that before? Prepare the onions, garlic, celery, carrots, and pepper, and place in a large bowl. Season the meat with salt and pepper and toss into bowl with the veggies. Mix well, cover and refrigerate for at least 2 hours. Using the saute function, brown the meat and veggies in batches in the olive oil and butter. Don’t overcrowd the Instant Pot while you are browning or you will not get a good sear on the meat. You may need to add a little additional oil during the process. After all the meat is browned, add the stock and wine to the Instant Pot. Stir and scrape the bottom to release all the “goodies” that are stuck on the bottom. Add the tomato paste and stir to blend well. Turn the IP off, add back the meat and veggies, combine thoroughly with the liquids. Place the top on turning to the locked position. Move the pressure knob to the closed position and set the manual timer to 25 minutes. Allow the stew to Natural Pressure Release (NPR). This will take a few minutes. I served ours over mashed potatoes, but you could use rice or pasta. The taste of the goat meat was not at all gamey as I thought it would be. 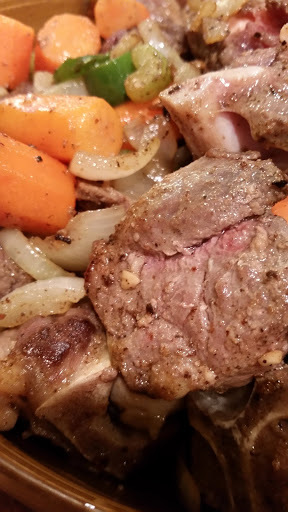 It was like beef in texture, very tender, and I’m looking forward to trying other recipes. As you can tell from the pictures, I did not add the roasted tomatoes or parsley to the finished dish. I think it would be delicious to add, but I simply didn’t get it on this dish.